I just recently started riding a motorcycle again after a 10-year hiatus. It’s a 2014 C50 B.O.S.S by Suzuki. It’s a great bike that’s perfect for my needs. I’ll write an article on it eventually. Since I have a family I love dearly, I want to be as safe as possible when riding my bike. That means good gear and some tech to help keep me safe. Over the next few weeks, I’ll be posting some of my recommended gear here on the site. The first part of that series is the best Micro SDXC card for GoPro and other cameras. I purchased a used GoPro Hero 4 Black to serve as a dashcam while I’m riding my bike. To properly store and transfer my video archives, I need a fast card for my GoPro… especially if I want to shoot 4K video. Before we talk about the best Micro SDXC card for GoPro and other cameras, let’s talk about how I use it with my bike. I have the GoPro mounted on my helmet just below my visor – in front of my chin. This gives me the best perspective for video. When I shoot in the 4K SuperView setting, the video playback is very realistic. The viewer sees what I see at all times. It’s much better than the side-mounted shots I’ve seen on YouTube. If I ever do get into an accident, it’ll be helpful. However, shooting in 4K SuperView takes up a lot of space. I quickly found that my 64GB card was only big enough for a few hours of riding. Every 15 minutes is about 4GB of video. That means I have less than 4 hours of video before the card is completely full. That’s not convenient for a dashcam; I’d be dumping video from the card too often. So, I set out to find a larger, faster card; one that I could recommend as the best Micro SDXC card for GoPro and other cameras. The only logical step up from a 64GB card is 128GB. Sure, some brands have 200GB or more, but the read/write speeds don’t work for me. At 128GB, my options were limited. Samsung and SanDisk are usually my go-to brands for storage. I use Samsung solid-state drives for my computers and SanDisk cards for my cameras. Unfortunately, neither of them makes a high-speed Micro SDXC card in a 128GB size. I wanted the faster read/write speeds for smooth 4K video and fast transfers to storage. Thankfully, GoPro listed Lexar as a compatible Micro SDXC brand. I did a lot of research and decided to recommend the Lexar 633x as the best Micro SDXC card for GoPro and other cameras. I chose the Lexar 633x as the best Micro SDXC card for GoPro and other cameras for several reasons. First, let’s talk about speed. There are two different ratings for SD card speed. The first is “speed class.” Nearly every card you’ll see at this point is class 10. This means that the minimum speed a card can read or write is 10MB/s. The next rating is UHS speed class. UHS stands for Ultra High Speed. This is a completely separate rating from the normal speed class. UHS speed class 3 requires that the minimum write speed be 30MB/s or higher. This is more than enough for 4K SuperView on a GoPro. However, that wasn’t my only concern; I wanted something that would transfer quickly to my archives too. In real-world testing, this card averages about 85MB/s read and 40MB/s write. That more than satisfies the UHS class 3 requirements, but Lexar only lists it as UHS class 1. I’m assuming this is because of the different bus mode classifications. Yes, more classes. UHS I vs. UHS II are bus mode classes – the 633x is listed as UHS I, but that doesn’t prevent it from reaching UHS class 3 speeds. In our testing, that’s true. I received a UHS class 1 card, but its speeds measure better than a UHS class 3 card. Lexar has a UHS II card available, but it’s not currently shipping in the 128GB capacity. That limitation and the higher price means we couldn’t recommend it as the best Micro SDXC card for GoPro and other cameras… but we’ll still list it as a slightly faster option below. It’s not just about speed; it’s about capacity, convenience, quality, and price. The 128GB size allows me to record a whole week’s worth of 4K SuperView footage (depending on my riding time). Every weekend, I pull the card out of the GoPro and toss it into the USB 3.0 card reader that comes in the package. Then I hook it up to the computer and dump the video onto my server. Within an hour, I’m back to riding my bike. None of the other cards I considered included the special USB 3.0 adapter. Most of them just had a standard SD card adapter. To me, the added USB 3.0 card reader was a huge win for Lexar. It’s what ultimately convinced me to call this the best Micro SDXC card for GoPro and other cameras. I also considered the Amazon reviews for several cards to determine the best Micro SDXC card for GoPro and other cameras. Most of them are real. Amazon has an ever-present spam review problem. If you see a single sentence review, you should probably ignore it. If you see 500 of them on a single product, you should probably avoid it. It’s often difficult to sort through product reviews to find real information. That’s why we do it for you. We also looked at B&H Photo, Adorama, reddit, etc. The reviews for this card were overwhelmingly positive. After reading those reviews and doing our own testing, we decided to name the 633x the best Micro SDXC card for GoPro and other cameras. It’s not the only option, but it provides the best performance and capacity for the lowest price. If your main concern is speed and not capacity, then you may want to consider Lexar’s 1800x Micro SDXC card. We don’t recommend it for most people because of the price, but it’s advertised speed is ridiculous for a SD card. It reads the fastest out of any card on the market right now. Real world data shows it reading at 250MB/s or more in its special USB 3.0 adapter. Of course, the write speeds are typically less than half that. If your main concern is quick transfer of footage from the card to your computer, this is your best option. Ideally, we’d recommend using the 633x until the 1800x comes down in price. If $120+ is too much for your budget, just stick with the 633x. 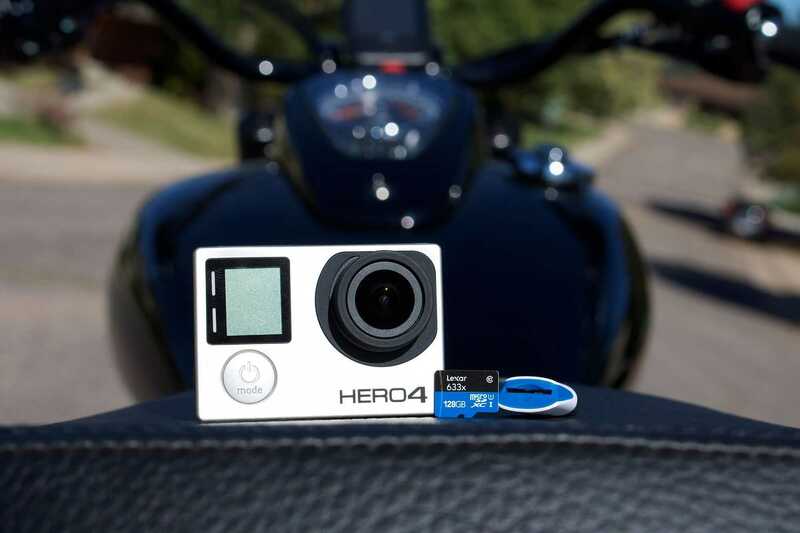 It’s the best Micro SDXC card for GoPro and other cameras. It would be irresponsible of us to write a recommendation for a storage product without warning you about proper backups. As with all types of memory, there are failures, so back up your data to several places. Don’t rely on a Micro SDXC card for permanent storage. If you’re shooting on location, bring several backup drives with you and copy the data from the Micro SDXC card to your computer and your backup drives regularly. We also highly recommend a cloud backup like CrashPlan from Code 42. We’ve been using it for years now. By using it, we mean that we’ve had drives fail and CrashPlan saved us from certain doom. It’s cheap. Sign up and protect the art that you create with the best Micro SDXC card for GoPro and other cameras.